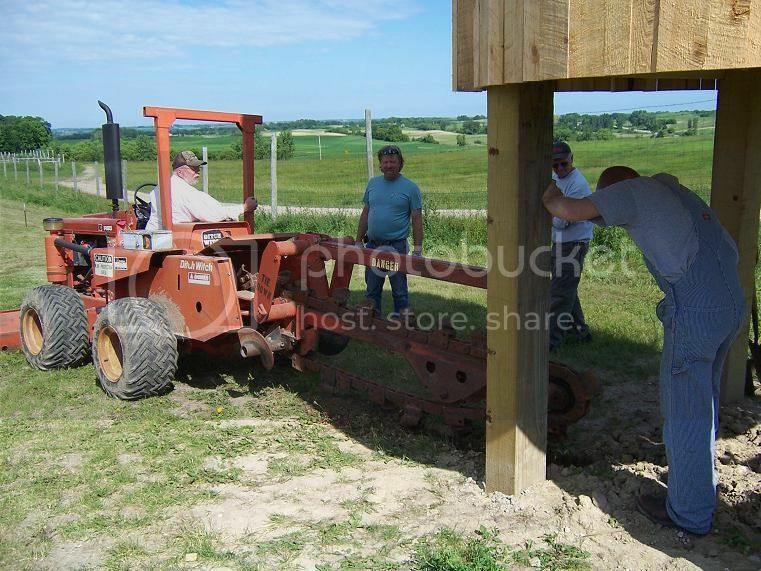 Discussion in 'Larson Sawmill' started by DOXEY41, May 21, 2013. 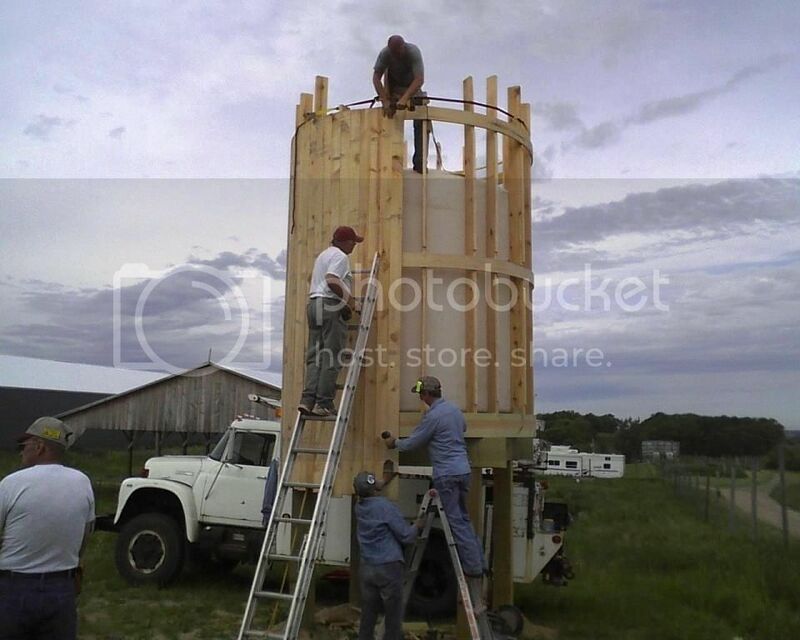 This past weekend (05/18/13 Sat) Craig & Clayton Larson got started on the new water tower. I got there around 1:30pm the holes were already drilled not sure if Clayton has pictures of that? Clayton brought his service truck which has a crane that worked so good much better than doing the poles by hand which we did with the roof over the mill! First pole going in the ground! Finished at 3:30pm everything went smooth and it was fun. Not sure what Craig is doing? Not long after we finished the job amazing Jane showed up with DQ blizzards thanks again Jane. 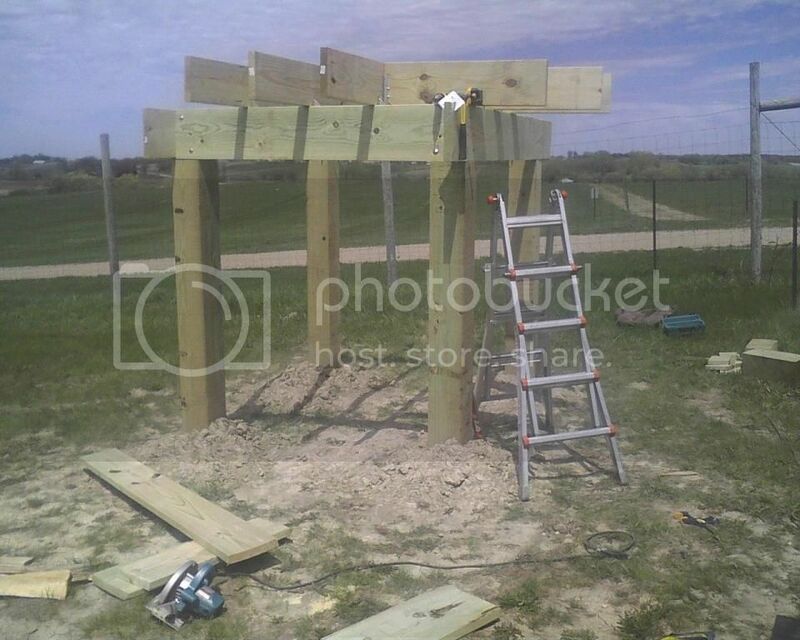 Thanks Clayton and Craig for heading up this project it will be a good addition to the Thick N Thin Sawmill. Looks like the project is off to a great start! 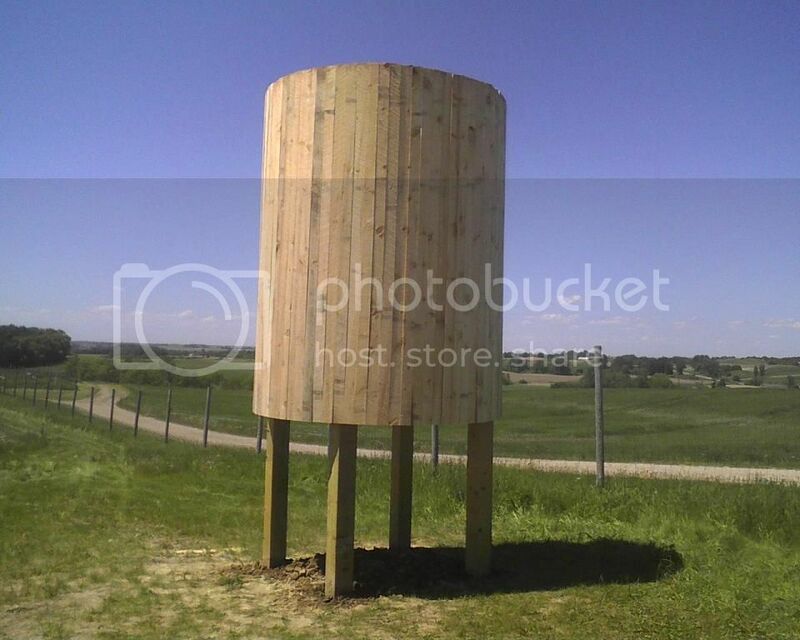 What is the main purpose of the water tower? We have to give Doxey a lot of credit. If he thinks an idea is good for Rollag, he is willing to pitch in and do his part! Josh, thanks for volunteering for this fund raising idea. Jerry, there will come a year that it will rain during the four days of the show. For that matter it could rain a lot for one day. What happens is the water truck can slide down the hill to get water to the engines but is unable to get back to the top due to it being so slippery. 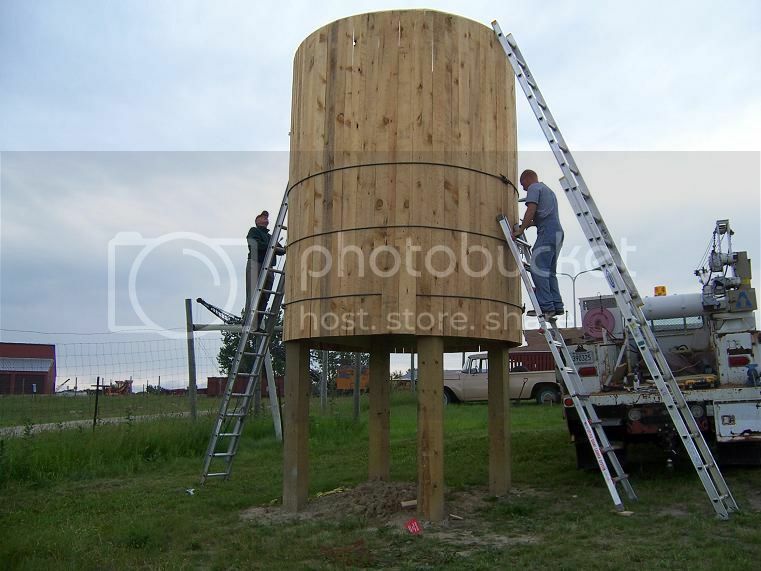 So with the water tower being close to the level area on top of the hill on the east end, he can fill the water tower even if it rains. this way the water truck should not get stuck!! This will also reduce how many times the water truck will have to come and fill us up. we all know how crowded it can get with people, so I hope this will also serve as a preventive safety issue. This way they can fill us up in the evenings or early mornings. 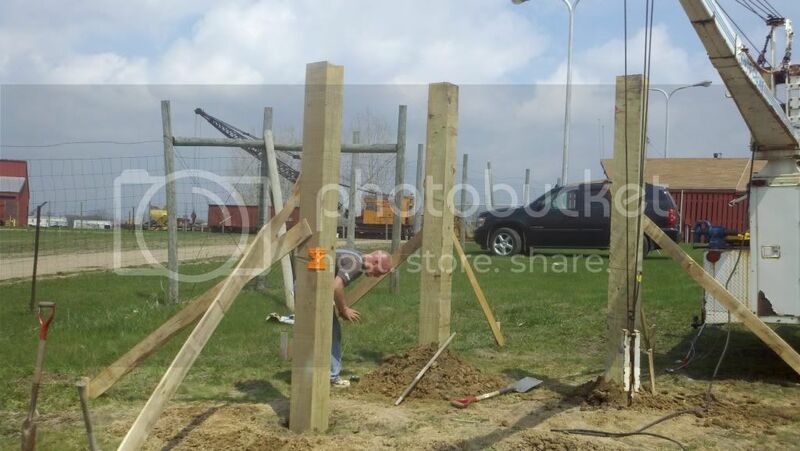 I'm confused in picture 4 are all those fence posts in the background unlevel (plumb) or are the brand new water tower support legs. Or is it for drainage? What is the reason for post #6? Why add facts and truth to a thread that has been perfectly derailed with silliness? You should never let facts get in the way of rumors and misconceptions. Ned, they were lined up with the fence when they started. By the time the ceeeeement was hard, the wind on the hill had already worked its magic. Jerry, its a water source for the brake! I agree with Ned. All kidding aside it looks great! Between weather and work, this has been a slow process getting started. A couple of weekends ago, I got started on the tank platform. Here's a couple of pictures showing what the tank will rest on. 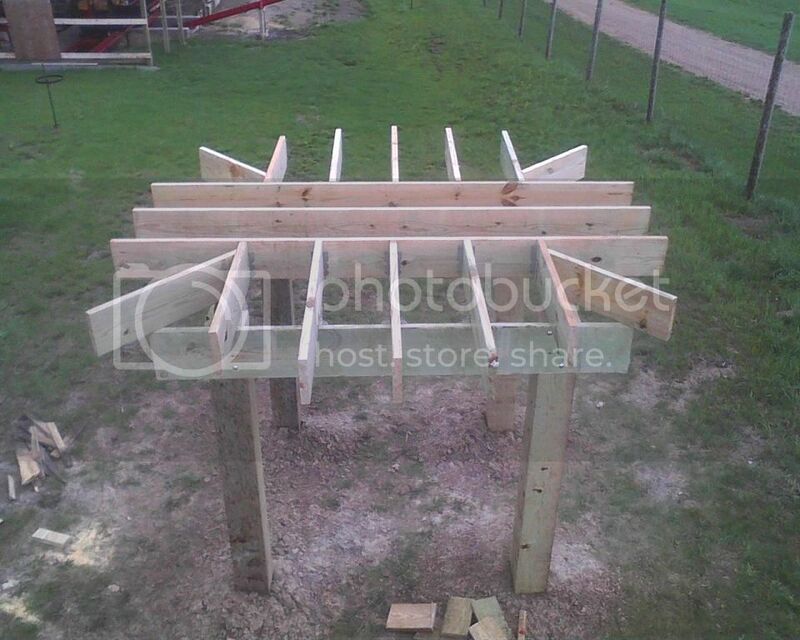 Only thing missing in the pictures is the crossbracing between the floor joists. 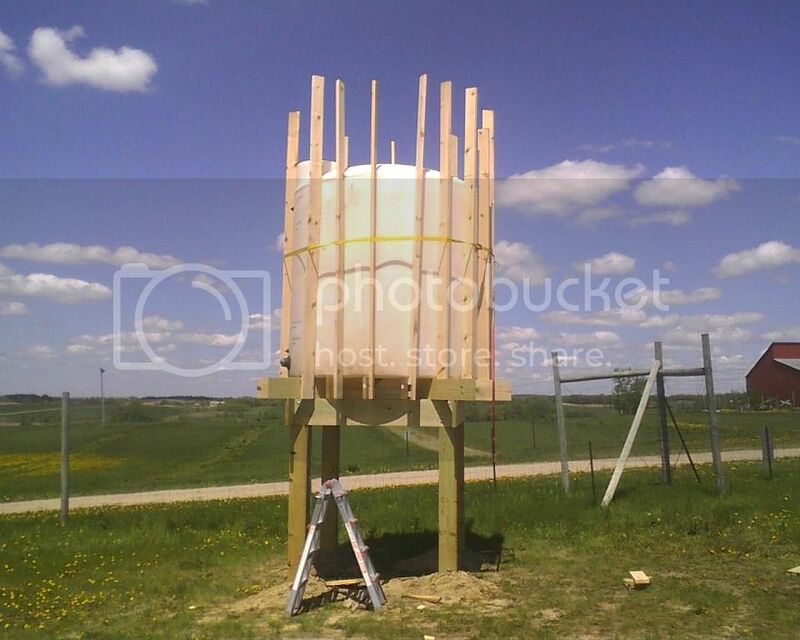 After finishing the platform, we set the tank and started fastening the uprights. We put a nylon strap around them so the plastic tank wouldn't blow away. Clayton, Where did you get the tank from? The tank was generously donated from Arctic Cat in Thief River falls!! If you happen to find another one. 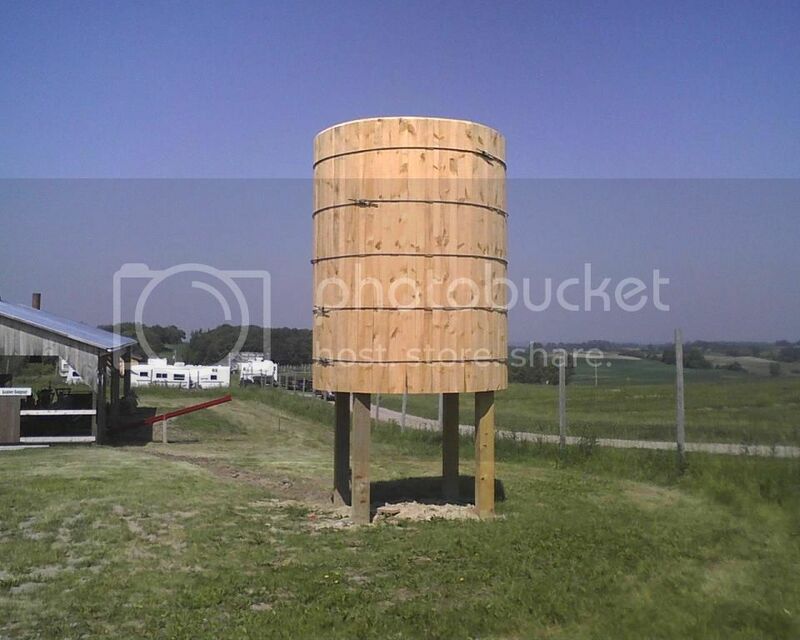 It would fit nice in our old wooden tank that we use for the water supply for Otto Building. 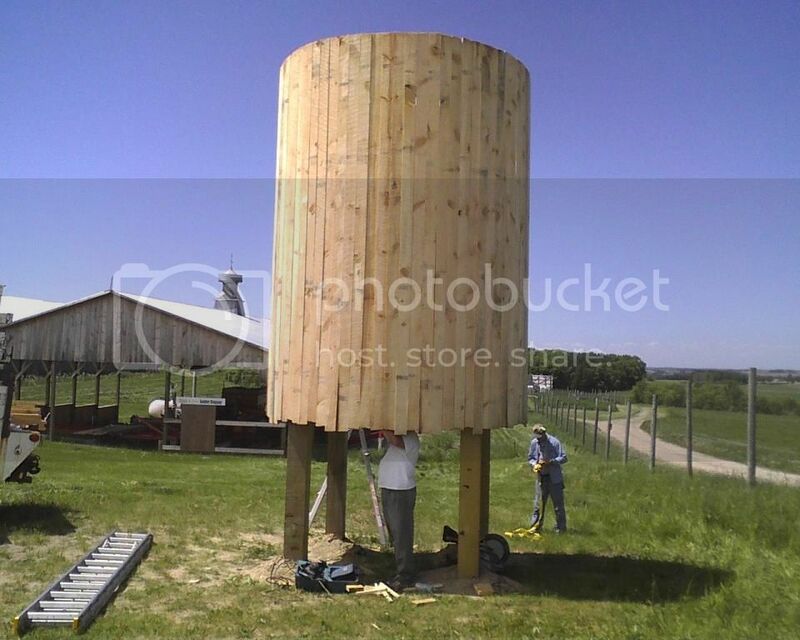 On Friday and Saturday of Father's Day weekend, we were able to make good progress on sheeting the water tower. Besides myself, Jane & Craig and many visitors, on Saturday we got help from Dave (Ski), David & Barb and Ryan. If I missed anyone, I apologize. Thanks for all the help! I had the 3 pieces wrapped around the tank Friday night (thanks Ryan). 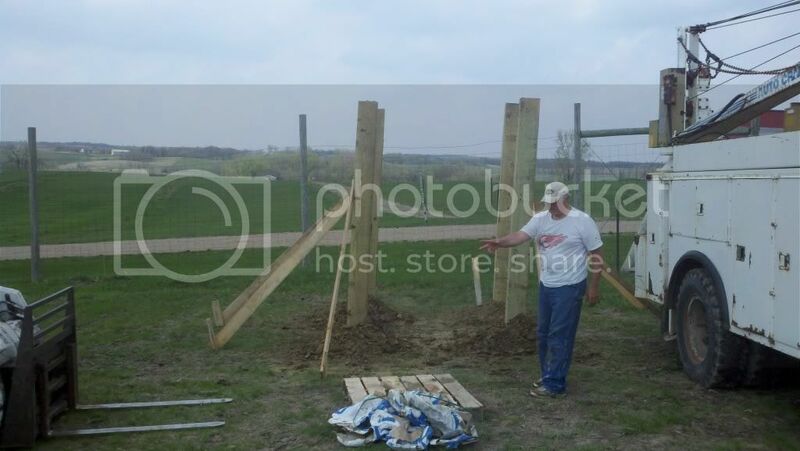 These pictures show what we accomplished on Saturday. Craig is underneath the tank scribing the line so we can cut the tails off of the sheeting. This is how we ended the day, top and bottom have the excess lumber trimmed off. Next thing is to do some plumbing on the tank and then I can set the roof. 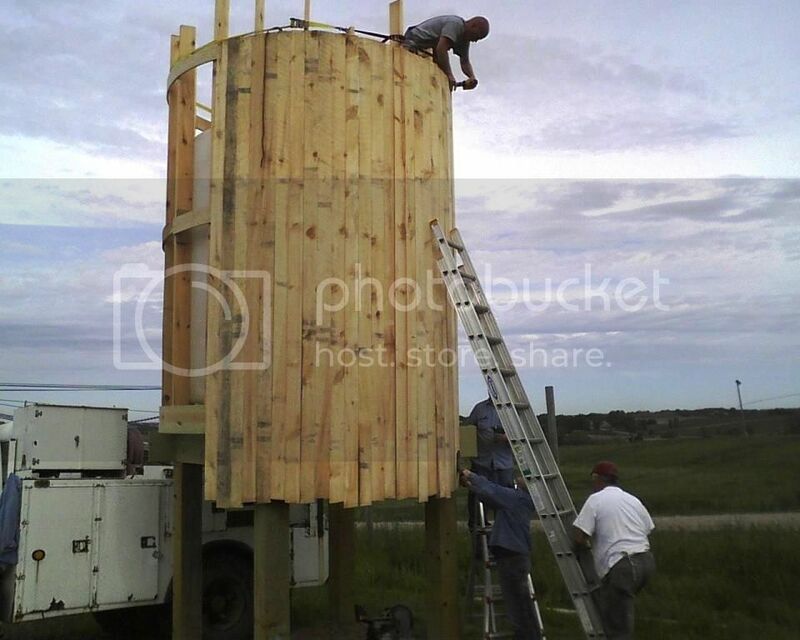 The last thing to do, will be to install the metal bands around the tower. 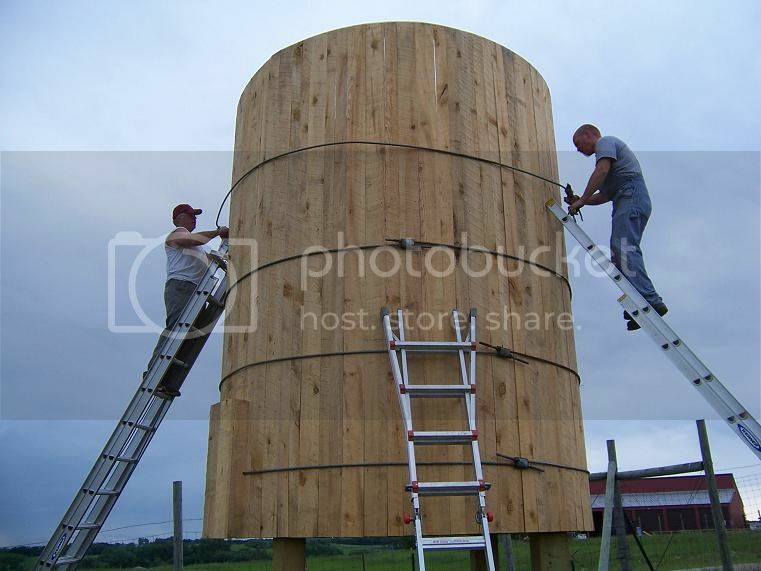 On Saturday morning, Craig, Jane & myself installed the silo rings on the water tower. Below are some pictures of this process. 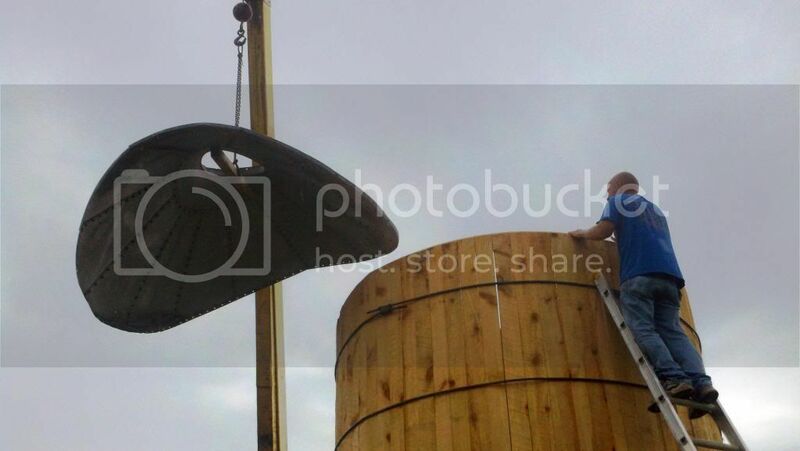 All of the rings have been installed on the water tower. Next is trenching the water line to the sawmill. 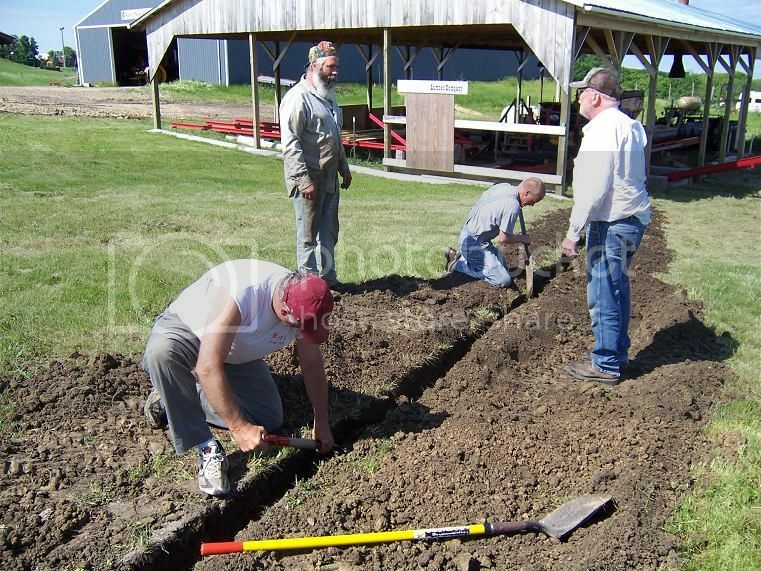 Jerry, Mark and Tom are getting the trencher lined up to head down towards the mill. Jerry heading for the mill. The new trencher works great. Here Craig and I are cleaning out the trench while Jerry and John Pelley are discussing whether the water will run uphill or downhill. We were done with the bands and trenching by noon and then home to get cleaned up so we could head over to Nicole and Kelly's wedding. Next weekend the roof will be going on the tower. Didn't get much time to talk with you Steam School Weekend, but that looks great. It is going to be a fantastic addition to the mill. Well Done. I want to know just how the heck anybody allowed Jerry to operate power equipment? Bet there was much until he got done and shut down. This new trencher.... Anyone could run! But we keep it limited because of the potential for damage to what it digs up! 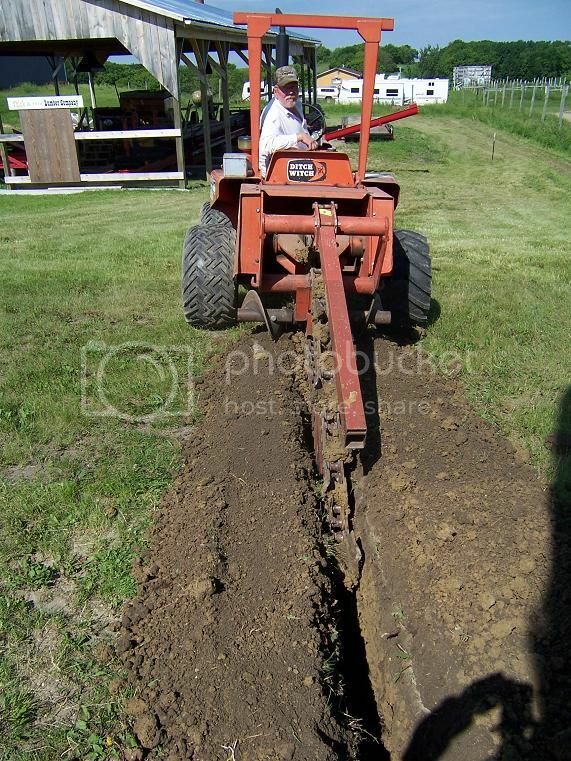 I always used to get Jerry to run "Trencher 1" (his name for it... mine was unfit for print here), so it is only right that he will be the "go to" guy for the new rig! It is a sweet running machine! It has over 1000 feet to go yet this summer, so it is a welcome WMSTR addition! Most of the edgumakaders I know ain't safe with a weedeater. Glad the new Ditch Witch is working so well. 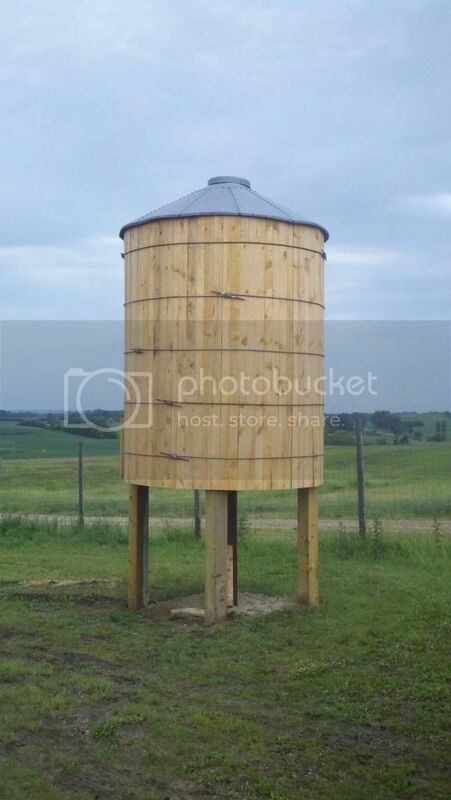 Can't wait to see the water tank. Awww! Heck! I can't wait for Rollage, period! It was time to install the roof, so I summoned Klinger and his big boom truck (didn't need it for weight, needed it for height). Here he is lifting it up and placing it on top of the tower. Setting down on top of the tower. You will probably notice the center does not look level. 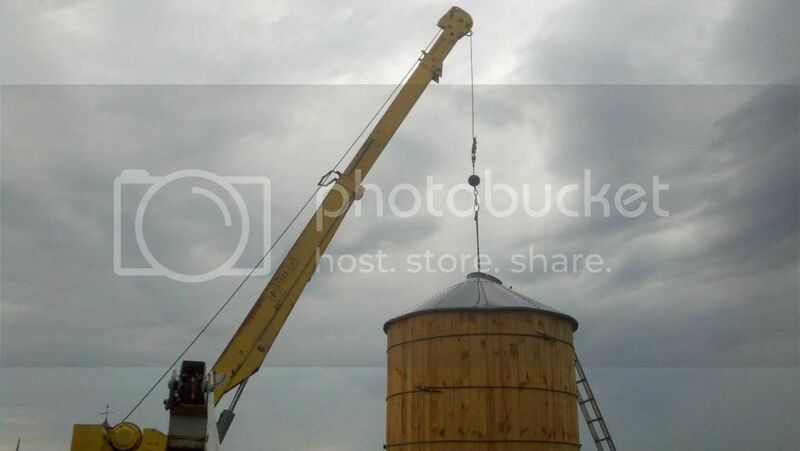 This is due to it being a feed mill grain bin top. I'll deal with that later. Took us about an hour to get to this point. It was raining off and on, so we had to be careful so nobody slipped and fell.